As humans, most of us are aware of the importance of choosing foods that’s are both healthy and nutritious. However, if we are responsible for a pet it is just as important that we extend this courtesy to our animals. Doing so can contribute towards your beloved furbaby enjoying a long, healthy and happy life with your family. For this reason, most veterinarians in Conneaut firmly advocate that you follow a specific diet of manufactured pet food that is designed specifically for the breed, age and nutritional requirements of your animal. Nevertheless, most owners also love to spoil their pet by sharing human foods with them too – sometimes even in place of their manufactured foods. While eating human food from time to time shouldn’t present a problem for your pet, you still need to ensure that you choose produce that is rich in nutritional value for him to get the health benefits that they offer. So, what are some healthy foods that your pet can eat? It is important to remember that cats should eat a primarily carnivorous diet as this is what keeps them healthy. For this reason, although there are some non-meat foods that your cat can eat, protein should account for the vast majority of her diet. However, since dogs are omnivores and can remain healthy on a varied diet, some of the foods listed below are more suitable for a canine than a feline. Pumpkin. Not to be consumed in excess as it can cause digestive upset, but pumpkin is rich in fiber and packed with goodness. Carrots. A fantastic way to boost your pet’s vitamin A levels. Peas. Cooked peas are sweet and make a great treat for training. Broccoli. These delicious vegetables contain lots of vitamins C and K.
Green beans. A good source of fiber as well as being packed with essential vitamins and minerals. Sweet potato. A firm favorite with many animals, particularly dogs. Spinach. Full of vitamins including A, K and C, as well as iron and calcium, spinach is a perfect cat-friendly treat. Cucumber. Boost your pet’s hydration by offering slices of cool cucumber. Blueberries. Well known for being a source of antioxidants, blueberries are ideal to take out with you or to use a treat when training your pet. Apples. Sweet and crunchy, these are very popular. Remember to remove the seeds are these are toxic if eaten since they contain a small amount of cyanide. Strawberries. Particularly popular with dogs, sweet strawberries are full of Vitamin C and natural fiber. Pears. Like apples, if you feed pears to your pet you must first remove the seeds. Banana. Nothing beats a juice banana – another highly nutritious snack. In the summer, bananas can be frozen and given to your pet as a cooling popsicle. Whole grains. Oats contain a lot of protein per calorie and have a texture that cats enjoy. Fish. Another very popular healthy treat for cats, although dogs will quite happily tuck into fish too. Ensure any bones have been removed so there is no choking hazard to your furbaby. Eggs. Cooked eggs are a great source of protein for any pet. Cheese. Cheese should be given sparingly since many animals are intolerant to dairy. However, if your pet likes it, a couple of cubes of cheese make a good treat. Peanut butter. Dogs absolutely love the taste of peanut butter, and a little smeared onto the end of his favorite biscuit is bound to be a very popular snack. Lean meat. Cubes of cooked chicken, turkey or beef are healthy, high-protein treats that can be given when desired or used in training. Be careful not to reheat, and to use quickly before it spoils. If you would like more advice on healthy foods that you can share with your pet, please contact our vets in Conneaut and someone will be able to give you more specific advice. What are some healthy foods for pets? Want to give your pets healthy and delicious treats? 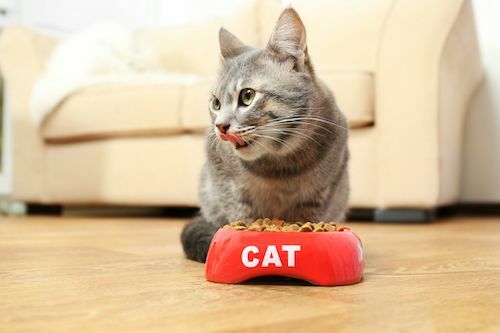 Read our guide of healthy foods for your pets, contact our vets in Conneaut at 440-306-3400 with questions. Does Spaying or Neutering a Pet Improves Their Behavior? Know more about the effects of spaying or neutering your pets and how it affects their behavior. For more information, call 440-306-3400 today. Know more about some tips and guidelines on how to keep your dog cool this summer. For details, call Conneaut Creek Veterinary Clinic at 440-306-3400 today! Know some guidelines on how to prevent skin issues in your dogs and cats this summer. For more information, contact us at 440-306-3400 today! Learn more about some firework safety tips for your pets. Call Conneaut Creek Veterinary Clinic at 440-306-3400 for more information. Learn more on how your furry friends convey emotions through their body language. For more information, contact us at 440-306-3400. Learn more on why putting a microchip to your furry friend could be beneficial to her safety. For more information, contact us at 440-306-3400 and schedule an appointment. Learn more about some guidelines on how to calm your hyperactive dog. For more information, call 440-306-3400. Conneaut Creek Veterinary Clinic shares to you the importance of brushing the teeth of your furbaby. Contact us at 440-306-3400 for more information. Know why your furry friend changes its drinking habits. Contact us at 440-306-3400 to learn more. Read about the symptoms, causes, and treatment of your pet's motion sickness provided by Conneaut Creek Veterinary Clinic. Read the reasons why your dog is itching and its ways to cure and prevent it with Conneaut Creek Veterinary Clinic. Learn more about the symptoms and causes of dog cough. Contact Conneaut Creek Veterinary Clinic to provide you the information you deserve. Dogs and humans are both affectionate creatures. Learn more about the risks of letting your canine friend sleep beside you at night. Contact 440-306-3400​​​​​​​ for details. There are some specific features that will make a vehicle more dog-friendly than others. Know more about what to look for in a dog-friendly vehicle. As a responsible pet owner, you undoubtedly want to ensure that your pet is getting the right nutrition to help them live a long, healthy life. Learn how to choose the right dog food here. What Is Whisker Fatigue In Cats, And How Do I Treat It? Whisker fatigue is a very real, but is a preventable condition. Learn more about whisker fatigue. If you don’t have a trusted veterinarian already in place, this could mean putting your animal in the hands of someone you know very little about.